The first is the famous Durga Puja which celebrates the 9 forms of the Goddess Durga and is dominantly celebrated in the eastern region of the country. The second one is more commonly known as the Sharad Navaratri or Maha Ratri, the tenth day of which marks the victory of Lord Rama over Ravana. 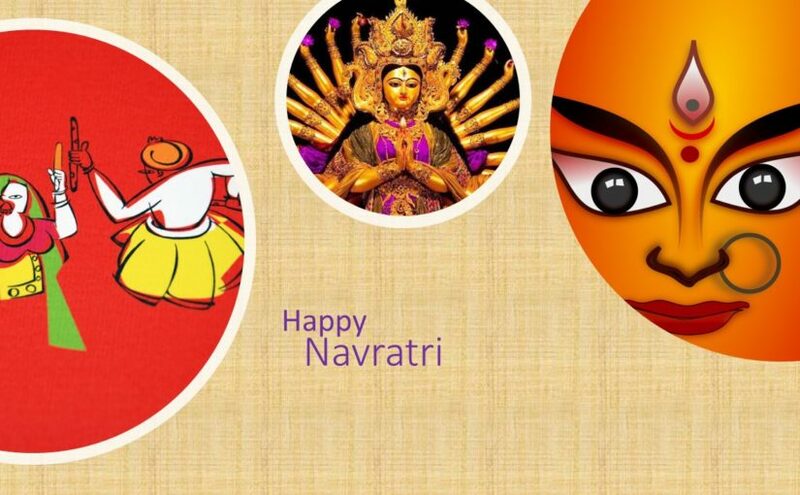 Each state or region celebrates the Navratri in their own way and we will be telling you about the cultures and the tradition that each state or region observes so that one can have an insight about the cultural diversity of their own country. Navaratri is famously known as Durga Puja in this region and can be said as the most important festival of the residents. It is a common sight to see grand Pandals built on the roadside worshipping different avatars of the Goddess Durga on different days of the Navaratri. The Shahsthi or the 6th day is the day when the people welcome goddess Durga and is the symbolic inauguration of the festival. The Saptami (7th), Ashtami (8th) and Navami (9th) are the days when the main worship takes place. On the 10th day or Dashami, the idols are ceremoniously walked to the river as an act of goodbye. Navratri is the coming of Ramlila in these parts as the whole story of Ramayana is enacted by stage artists on temporary built stages or in the temples. The celebration ends with the burning of the larger than life-size idols of Ravana, Kumbhakarna and Meghanada. Gujarat: – In Gujarat, the Navaratri is celebrated by keeping a fast for a whole day or keeping partial fasts on each of the nine days. This is mainly done in the remembrance of one of the 9 aspects of Goddess Shakti. A famous dance form known as Garba is also done. Goa: – In Goa, the Navratri is celebrated by placing a copper pitcher installed with the help of clay in the house around which 9 types of grains are placed on the first day. On the rest of the days, various devotional songs are performed as a form of devotion. Karnataka (Bengaluru) : – Navratri is celebrated in this state by lighting up the temples and other places of great religious importance. There are other regional practices as well as the worshipping of the royal sword related to the legends of the state. Kerala: – In Kerala, the last 3 days of the festival, 8th, 9th and 10th, books are worshipped to show gratitude to the Goddess Sarasvati. Telangana: – in Telangana, the goddess Parvati, Lakshmi and Sarasvati are worshipped for three days each in the same order to seek their blessings. The females in the region also make Bathukamma, a floral decoration to worship God.